This is the pattern for my bracelet "One Sided Pétales". A crocheted rope bracelet made of seed beads size 11/0. On the contrary to the bracelet "Pétales", in this bracelet pattern the flowers remain on the one side of the bracelet. The instruction shows the used pattern detail figures, sequences and requires no advance knowledge in bead crochet. The pattern is available in English language and will be only send as a PDF file. I offer the pattern, not the bracelet. You can finish the bracelet either with an invisible joint or with a clips. 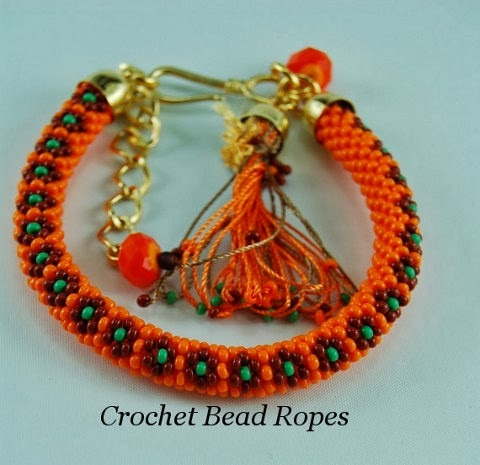 If you are a beginner in doing bead crochet bracelets this pattern can be a good starting point.